Le CCB organise des méditations tous les mardis et mercredis de 19h30 à 20h30, des enseignements du Ven Mogchok Rinpoche une fois par mois. Dojo zen soto de la ville de Montpellier. Pratique de la méditation et enseignement, organisation de matinées et journées de zazen. Le dojo zen de Montpellier est affilié à l\'AZI et à l\'ABZE, il protége et transmet la pratique et l\'enseignement du Zen Soto dans l\'esprit des différents Maîtres qui se sont succédés depuis Bouddha jusqu\'à Maître Deshimaru et Maître Yuno Rech. Sur le site du dojo zen de Montpellier vous pouvez prendre connaissance de nos activités et horaires de pratique ainsi que vous inscrire en ligne aux matinées et journées de zazen. Our center is a lay Buddhist group, meditating under the spiritual guidance of H. H. the 17th Gyalwa Karmapa Trinley Thayé Dorjé and Lama Ole Nydahl. Our center belongs to a network of more than 600 Diamond Way Buddhist centers worldwide. in our center is the 16th Karmapa meditation. It is a guided meditation and no specific experience of meditation is required to practice with us. Besides, beginners and newcomers are very welcome to join us at 8pm on Wednesdays and Fridays, half an hour before our public meditation starts, in order to get an introduction to our center and practice. All our meditations are totally free we only request regular practitioners to participate in our assocations expenses. Theres no need to book in advance neither to bring any particular clothes or cushion. Centre bouddhiste tibétain de la lignée des Drikung Kagyu placé sous l\\\\\\\'autorité spirituelle du Vénérable Lama Konchog Tharchin Rimpotché. 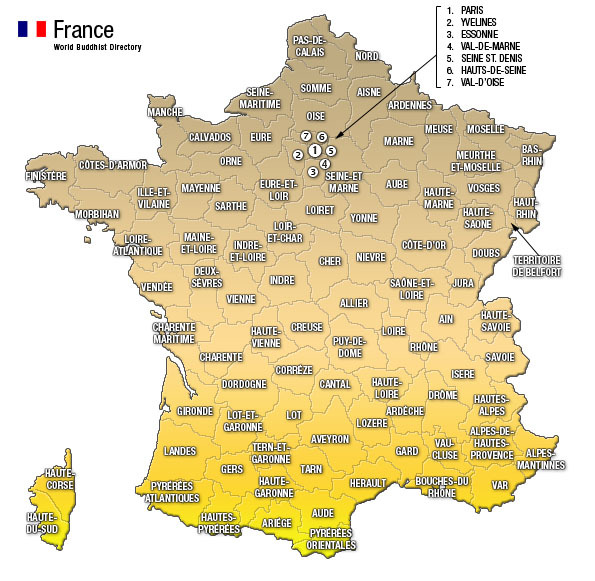 3 centres en France, en Essonne, en Seine-et-Marne et en Bretagne. Since March 2006, "Denshinji - Centre Zen Martinique" and "AZI/Denshinji - Centre Zen Guadeloupe" are Denshinjis branch zen-centers respectively in French Caribbean prefecture-islands Martinique and Guadeloupe. Shôkôzan Denshinji Buddhist Institution is a Buddhist Temple and a religious community in the Soto Zen tradition founded in Blois - France - in 1992 by Zen-master Kengan D. Robert. This Institution is a member of Union Bouddhiste de France — UBF (French Buddhist Federation) and a member of the Japanese Religious Federation SÔTÔ-SHÛ the authority of the Soto lineage in Zen Buddhism tradition. Shôkôzan Denshinji Institutions purpose is the study and, above all, the practice of Shakyamuni Buddhas Teachings within the Soto Zen tradition transmitted in Japan in 1225 by zen-master Dôgen and zen-master Keizan. The main practice is the "Collecting of ones mind in sitting position" (jap. : zazen) which zen-master Dôgen named « Just sitting ! » (jap. : shikantaza). Dharma.house was founded in 2016, as a complementary offer to traditional meditation centres. Our mission is to inspire and show by example that it is possible to create another way of life, free from ordinary pettiness, free from complaining about our circumstances and free from mental rigidity. Fondée en 2016, Dharma.house propose une offre complémentaire aux centres de méditation traditionnels. Notre vocation est d'insuffler et de montrer par l'exemple qu'il est possible de créer une autre façon de vivre, libre des petitesses ordinaires, affranchie des plaintes concernant nos circonstances et conditions de vie, et exempte de rigidité mentale. Deux séances de zazen par semaine. In our little dojo, we practise zazen, the zen meditation from Master Deshimaru. Beginners can come and practise also. Le Groupe Shambhala de Lyon propose une soirée hebdomadaire de pratique et d\\\'enseignements, ainsi qu\\\'une journée de pratique (nyinthün) une fois par mois. L\\\'ensemble de ces activités sont ouvertes à tous, débutants y compris. Schedule : Every Monday : 6:15 p.m. - 8:00 p.m.
Zen Meditation or Zazen consists in the practice of a quiet sitting. Thanks to an every-moment-let-go, the mental images which veil the true nature of ones inner being, fade and make way for the very essence of Reality. Stemming from Chinese, then Japanese Buddhism, Zazen does not purport to a philosophical, religious, mystical or ethical system. It is a path for awakening oneself to ones core-reality. The method transmitted here belongs to the Sôtô, which is one of the two main branches of Zen, as taught by Master Kôsho Uchiyama who wanted to cleanse the practice from all ritualistic or religious superfluity. He emphasised the fundamental importance and correctness of the meditative posture. Khyoung Dzong association organizes the teachings of Chogtrul Shiva Lodrö Rinpoche and gathers his Dharma students, offering supports to the members for their spiritual practice such as texts, translations, cd-roms. Khyoung Dzong proposes also monthly sessions of study and practice of the Nyingmapa lineage of Namkha Khyung Dzong. Situé dans le Champsaur à vingt minutes de Gap, dans un environnement de montagne paisible et propice, ce lieu de retraite méditative permet de développer et d’approfondir la méditation selon les Enseignements du Bouddha. La méditation rend possible la reconnaissance de la nature de l’esprit. Nombre de méthodes existent et sont enseignées selon une lignée de transmission ininterrompue. La détente et l’ouverture permettent une compréhension profonde de la véritable nature de l’esprit. Ainsi il est possible de se délivrer de la souffrance inhérente à toute existence. Développer et préserver l’amour et la compassion pour tous les êtres ainsi que l’aspiration vers l’Éveil (qui signifie la libération de toute souffrance), comprennent tous les aspects essentiels de la voie. Vous êtes les bienvenus pour séjourner selon vos souhaits et vos possibilités selon cette aspiration à la retraite méditative. In true Buddhist tradition we wish to welcome all comers; of any or no faith at all. This may go against some traditions but we would like to offer those that might be either curious or like myself trying very hard to live by the Dharma but struggle to meet their own expectations the opportunity improve their practice without the worry of being over whelmed by a multitude of established Buddhist practitioners. We also welcome those who are established in their practice, and invite those that would be generous, to offer their guidance. There are plenty of things we need as human beings, but one of the most neglected, is peace and quiet. Or more specifically, an absence of distraction and stimulation. We live in a frantic society, where we are constantly bombarded by news, media, gadgets, family, friends, telephones, computers, television and work. Space and silence are important and rare. And like anything that is rare, they need protecting and nurturing. As our lives become noisier and busier the value of silence and solitude, difficult as it may be to find, becomes even greater. Perhaps visiting a Retreat is the perfect opportunity to try making space for quiet, to reclaim some silence and see whether it makes any difference to you. By finding some time to look deep within yourself to find peace and tranquility, you are giving your mind, body, and soul the time to revitalise itself and help you look, feel, and be a happier and healthier and more controlled person.